We are a very friendly club based at Ironmonger Row Baths in central London. We are passionate about diving and the marine environment. Part of the British Sub Aqua Club (BSAC), we are also one of the most active clubs in the country and our members enjoy some of the best and most adventurous diving both here in the UK and overseas. If you are a qualified diver, you are welcome to join the club and dive with us using your current qualification. 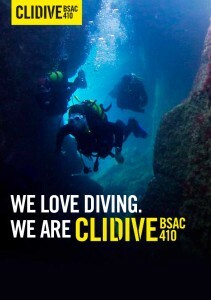 If you’ve always wanted to discover the thrill of scuba diving, Clidive is the perfect organisation to learn with. Our experienced team of instructors will teach you all the skills you need to take you from your first pool dive to qualifying as an Ocean Diver and the excitement of exploring the underwater world. Nearly all of the the photos on this website have been taken by club members. Explore these pages then contact us!